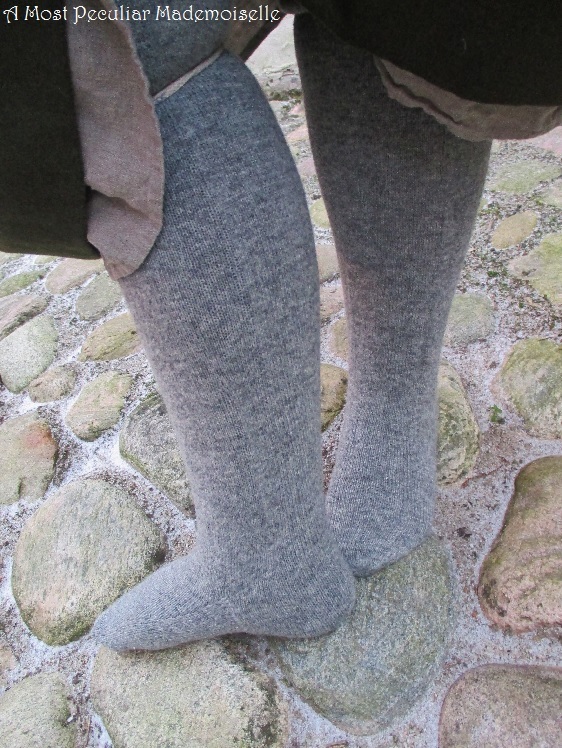 In the winter of 2008/09 I began knitting a pair of plain Ca 18th century wool stockings, using the tutorial on Mara Riley’s page. Progress was pretty good, until I ran out of yarn just after I had made the heels. I had got this yarn for free, and it wasn’t available in the shops. Now, I did have an in-progress nalbinding project where I had used this yarn, so I set out to unpick it. Those of you who ever unpicked nalbinding knows how much time that takes, so when I had enough to keep knitting, I was rather fed up with the whole thing. I put the almost finished stockings away, and though I looked at them once a year or so, I never quite felt like picking up the work again until a couple of weeks ago. I knitted a lot over a few days, and they were finally done. The yarn is a two ply (lace weight) natural grey wool, knitted on 2 mm (UK 14/US 0) double ended needles. The gauge is ten stitches per inch. If it’s any help, the pair weighed 136 grams when finished. They are not the prettiest stockings seen – I wasn’t very good at knitting when I started out, so the tension between needles differed too much. Still, a finished project is always nice, and not many will look at my legs up close – yay for long skirts! I took careful notes throughout the knitting process, and have become a better knitter, so hopefully the next pair (whenever I get round to them) will look better. I feel mortified when looking at the stockings laid flat – my stocky legs and heavy ankles have been a sore spot with me since I was in my teens. At the same time I feel guilty for feeling like that – my legs serve their primary function well, which naturally is more important than how they look. Also, the uneven knitting is seen more clearly this way. 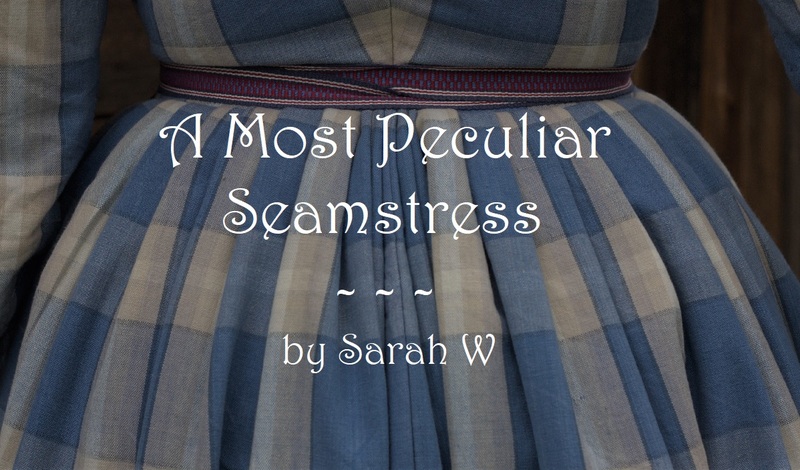 This will be my first challenge of the Historical Sew Monthly 2016. Material: 2 ply (lace weight) wool yarn. Pattern: Based on the tutorial on the Mara Riley page. Year: According to the Mara Riley webpage, 17th/18thcentury. Mine will likely be worn mostly for early 19th, they seem to be close enough to Swedish lower class stockings of that period. How historically accurate is it? The techniques and material are all right, but execution is not too nice. I won’t rank it higher than tolerable because of that. Hours to complete: No idea. First worn: For the pictures. Total cost: Nothing at this time, as I got the yarn for free. The stockings look amazing! I've never learned to knit properly, and it's a real source of frustration when I see nice things like this. As to your “stocky” legs and ankles, perhaps it's a matter of perspective? 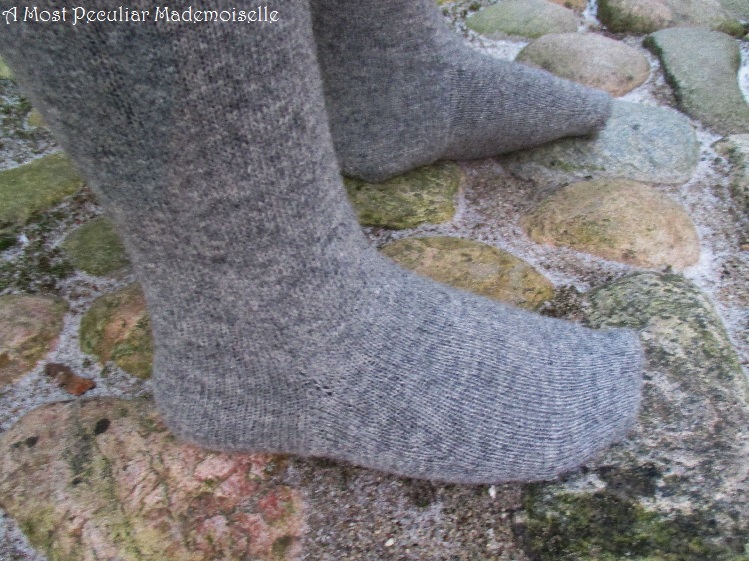 When I first pulled up this post and scrolled through your photos, the only thing that went through my mind (other than knit envy) was that you have such nice, tiny little feet! I suppose we are all our own worst critics, but I can assure you as only a total stranger on the internet can, that your legs and ankles look fine, and that you may have Cinderella-caliber feet. Thank you ❤ Actually, the pictures did turn out rather well, and show my legs to advantage. My feet are average in length, but quite high over the instep, which give them baby like proportions. That can give the illusion of them being small, but finding shoes (especially dress shoes and ballerina flats) that don't pinch is pain. Well, sheep-coloured yarn is my favourite and grey is my absolute favourite, so I think they look fab. I'm very jealous. 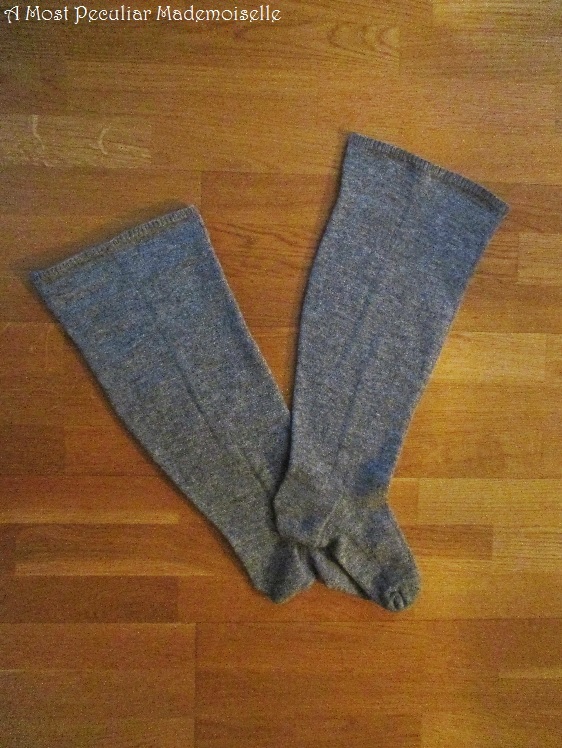 I've knitted a few pairs of socks but never bigger than ankle socks. How very brave of you! Lovely work (and how satisfying to finally finish something that's been hanging around for so long!). Thank you, I love natural greys too. They look great. Have knitted a few pairs of socks but looking at Mara's tutorial am a bit confused re folding the heel flap in half and binding off. Does this create a thicker heel and is the heel then wide enough? 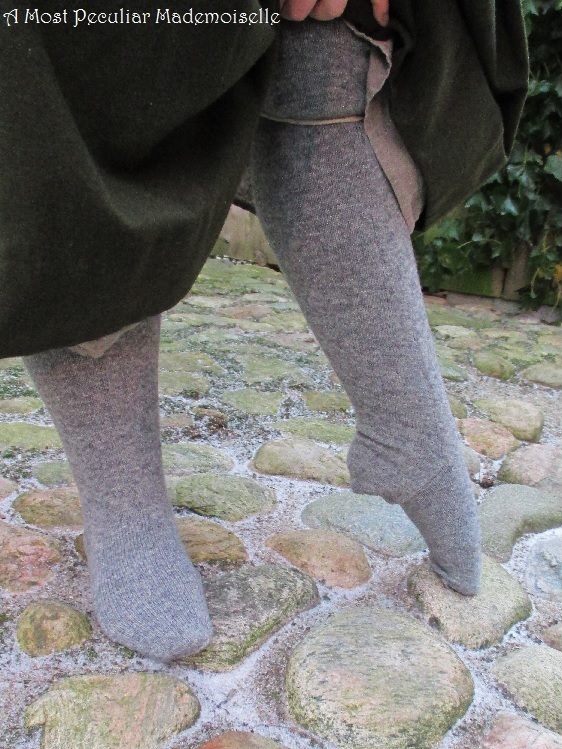 It does create a seam under the heel, but seen in a historical context (where the style of knitted stockings are in many respects an evolution from the fabric hose of earlier eras, where seams under the heels were not uncommon) it makes sense. I don't think it will be uncomfortable. I do think the heel is wide enough. And altough I feel the same about my legs, I think yours are looking very fine! Beautifully done! It's amazing how many crafting skills you have. The stockings turned out beautiful! You're so talented and your (re)creations always look spot on period.